If you are interested in learning more about the product Monray Antiperspirant Foot Treatment, and want to know more details about its formula and price, then you’ve found the right review. Monray Antiperspirant Foot Treatment is a product which claims to eliminate any and all odor caused by foot perspiration. Another bonus of Monray Antiperspirant Foot Treatment is that it is effective for the prevention and treatment of fungal infections known colloquially as athlete’s foot (tinea pedis), as well as the uncomfortable symptoms that come with it, such as rashes, cracking or scaling of the skin due to profuse perspiration. If you wish to know more about the ingredients and guarantee policy, make sure to continue reading this review. Monray Antiperspirant Foot Treatment uses Aluminium Chloride Hexahydrate as its primary key ingredient. This substance has long been used in the antiperspirant industry, since it can effectively decrease sweating by altering the behavior of sweat gland cells. The other active ingredient, monoglycrin, is used to facilitate skin penetration, allowing the substance to seep under the primary dermal layer, which is how it achieves its long lasting effect. The base contains neither alcohol nor any scent, this way it will not interfere with perfume or cologne. 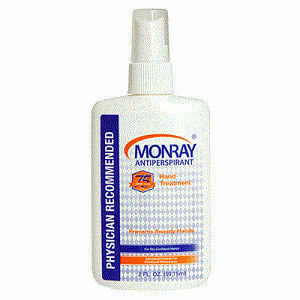 Monray Antiperspirant Foot Treatment is a user-friendly product which places customer convenience above all else. The product is to be applied before bedtime so that it can exact its effect overnight, this way the usage of the product may remain private and discrete. The feet must be washed before use, and completely dried, as Monray Antiperspirant Foot Treatment reacts with water. Three or four sprays of the substance should be applied to the target area, and rubbed into the skin. Don’t wash off the spray. Leave it on for the night, because this way you feet will remain odorless throughout the next day. Due to the presence of aluminium compounds, many people may be prone to allergic reactions or other uncomfortable side effects. These may include skin irritation, rashes, burning sensation or general discomfort. Ironically, these are identical to the symptoms Monray Antiperspirant Foot Treatment seeks to cure in the first place, so if you have an allergy to aluminium, avoid using this product. In the case of Monray Antiperspirant Foot Treatment, you’re paying more for the brand than you are for the product. Purchasing from Amazon, you have to pay $21.50 plus a $4.75 in shipping for a single 2.5 ounce bottle, which makes this the most overpriced product of its kind. Monray Antiperspirant Foot Treatment, just like any Monray product, features a 100% risk-free 30-day money-back guarantee for customers who may not be satisfied. Monray Antiperspirant Foot Treatment is an effective product with strong ingredients backed by a reassuring guarantee. Unfortunately, however, the high price is a strong negative, and the use of aluminium is odd, since nowadays it is commonly known that it isn’t the best for your health, and more effective alternatives exist. Jimmy Rodriguez	reviewed Monray Antiperspirant Foot Treatment	on June 10th	 and gave it a rating of 3.